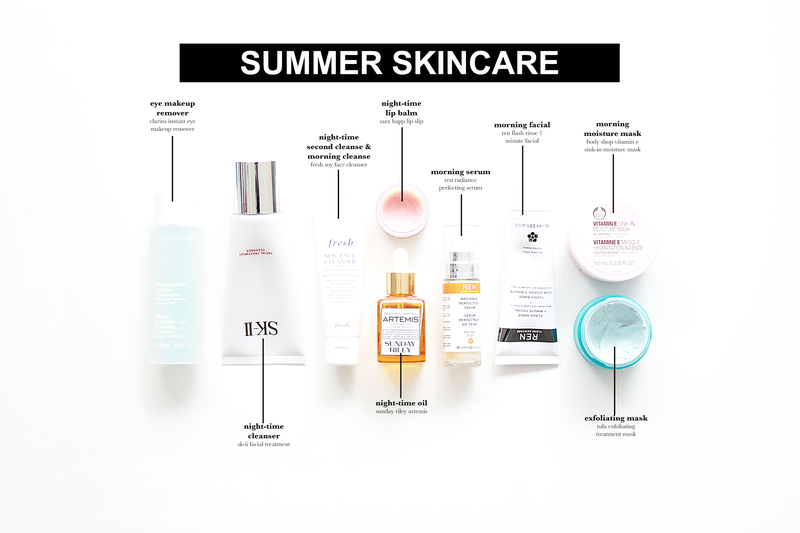 With the boiling hot days of Summer comes a revamp in the skincare routine - essentially pairing it down a bit and taking out some of my heavier moisturizers. Read on to see the products I've been loving during these warmer months! Eye Makeup Remover - Clarin's Instant Eye Makeup Remover : Hands down a "can't live without it" product for me. As you can see in this photo I was basically out of it - I'm actually on my fourth bottle or so of this stuff. It's powerful in terms of getting my toughest eye makeup off, but super gentle on my eyes. It melts away the makeup, doesn't sting, and doesn't leave behind any residue. I sort-of, kind-of panic when I get to the bottom of this bottle. Nighttime Cleanser - SK-II Facial Treatment Cleanser : After removing my eye makeup this is my go-to cleanser for going in and getting makeup off while in the shower. It starts as a cream and foams into a lather and the tiniest amount really gets the job done. If I have a bunch of makeup on I'll pair this with a muslin cloth and it works wonders! Even though its powerful, it doesn't ever leave my skin feeling stripped. Second Cleanse + Morning Cleanser - Fresh Soy Face Cleanser : At night I usually go in and do a double cleanse - just to make sure all the product is off my face. This is my favorite for that task as well as a nice morning cleanse. It just feels great, smells super fresh (which is an added bonus early in the morning), and leaves my skin super soft. This is another product that doesn't strip the skin and is great for sensitive skin as well. It is filled with amino acids, soy protein, and a bit of rosewater. Nighttime Oil - Sunday Riley Artemis* : I love this stuff, I actually went a few nights the other week without using it and instantly wished I hadn't. I can tell such a big difference in my skin after using it. It helps balance my skin, keep redness down, and it's thick formula is nourishing and hydrating. It's the perfect overnight oil. It also helps to keep spots from popping up as well. One thing to note - the smell is strong and if you don't let it sink in long enough it can leave behind a bit of orangey color on lighter bedding. Nighttime Lip Balm - Sara Happ 'The Lip Slip' : I have the driest lips ever. Like it actually drives me insane because it makes wearing matte lip products a challenge. I've tried everything, including just good old water and they still persist. However, the one thing that makes the biggest difference in my lips is using this product at night. I put on a thick layer before bed and overnight it works it's magic. Not only is it long lasting and incredibly hydrating it also exfoliates my lips to an extent while I'm sleeping. Daytime Serum - Ren Radiance Perfecting Serum : Since the Artemis oil is much thicker and definitely a nighttime product I turn to one of my REN favorites for daytime. The Radiance Perfecting Serum is lightweight, dries down quickly, and leaves behind a nice glow. The perfect base to start applying makeup to. REN Flash Rinse 1 Minute Facial : On mornings when I'm feeling a bit grey and dull I love throwing this insanely quick mask on. The Vitamin C is brightening and helps to even out the complexion. It's the perfect quick wake-up for my skin. I apply a pea-sized amount all over my dry face and then massage it in with a bit of water. I then let it sit for 1 minute and rinse off and voila, the perfect on the go skin treatment for weekdays. Tula For Life Exfoliating Mask* : When my skin is really feeling dull and in need of a good exfoliation I'll turn to this Tula mask. I like this one both at night or in the morning, really whenever my skin needs a good exfoliating. I let the mask sink in for a bit and then I rinse it off with my hands or a muslin cloth. Since the product is a dual exfoliator (both chemical and physical) it really gets in there to get rid of dull skin. After using this I notice a big difference in my skin. It's glowing and polished. The Body Shop Vitamin E Sink-In Moisture Mask : This is also one I prefer in the morning! This summer I've really gotten into waking up a bit early to do a little pampering pre-work day. If I'm feeling super dehydrated and dry I love to slather on a quick layer of this stuff and let it soak in while I'm making my coffee and catching up on the morning news. It does leave a tacky layer behind so I usually rinse off the last bit and then my skin is perfectly prepped for makeup! Now tell me...what are your summer skincare must haves? Anything fantastic out there I need to try? My skin is pretty dry, so I'm always searching for a good glow! I have desert dry lips too and recently I've been using the Glossier Balm Dotcom the coconut version that they released for summer and it's been helping a lot. I also like their priming moisturizer cause it sits so well under makeup plus it makes you dewy. summer is so tough on your skin and hair too so I'll have to look into these! Thanks for the tips! Ahh okay, so many Glossier recommendations! Definitely going to have to place an order before the summer ends! Summer is just as tough as winter in my opinion! I always walk everywhere so I'm always out in the elements with my skin reacting to the temperature changes! My wishlist has just got a whole lot longer, Faith!!! I'm despo to try the Sunday Riley oil, it sounds awesome and the Fresh Soy cleansers sounds good too!